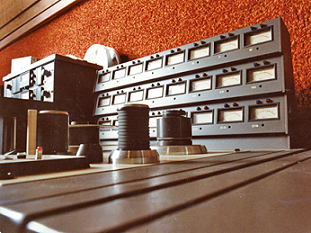 In the “Disco Days” of the late 1970’s, floor carpet was often used in studios as acoustical wall treatment. Orange shag was a particular favorite. 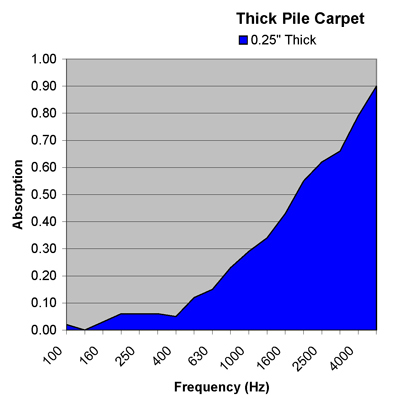 We had an independent lab test “Thick Pile Carpet” acoustically, and their report showed a respectable NRC=0.25. The test did, however, exhibit a steep increase in absorption toward the upper frequencies and almost no absorption in the bass range. This may have been particularly useful for sizzling Hi-Hat and Wah-Wah (“Talkin’ ‘bout Shaft”), but not for overall sound absorption. While not as great a fire hazard as paper egg cartons on the wall, flooring materials may not meet fire code requirements for vertical wall coverings. This is due to the increased flow of oxygen, upward along the wall surface, which facilitates combustion, particularly in room corners. Sound Channels Acoustical Wall Fabric is a great alternate to using wall carpet as it passes corner burn and vertical burn tests. In addition, it absorbs sound well in the speech range, making it a great material for use for conference rooms, offices, hallways or anywhere you need to improve speech intelligibility. For the record, the test was performed using quarter-inch, nylon-backed, grey-colored, thick-pile carpet. By the end of the decade leading up to the late 1980’s test date, the orange shag had lost some of its earlier popularity. Thick Pile Carpet Acoustical Test.